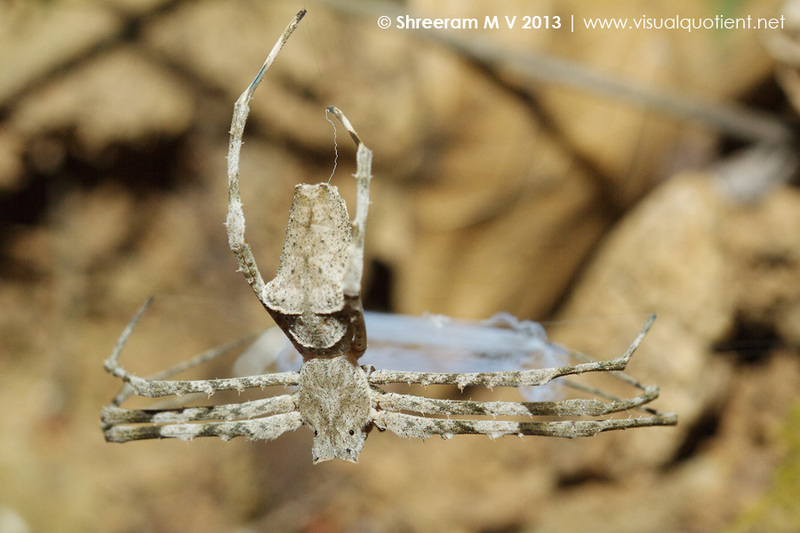 In April this year, on a night walk near Agumbe, we came across this spider. It looked very different from what I’d seen before. Also, the web caught my attention and I photographed it from a couple of different angles to try and capture the essence. After I got back, the photograph was safely backed up in my hard drives along with the rest of the images from the trip and life went on. Until, I was running through the trip photographs with a friend a month later. When he saw the image, he jumped out of his seat and was really excited to see the image. And then the question came – “Did you photograph the eyes of the spider?” Well, the spider was fairly close to the ground, it was with great difficulty that I got a footing at that place…all the excuses that I could muster came out. He asked me to check out the spider on Google. Turns out the spider belongs to a family called Deinopidae. Members of this family are also called Net-Casting Spiders. These spiders have long front legs and they suspend their rectangular web between the legs (as shown in the photograph). 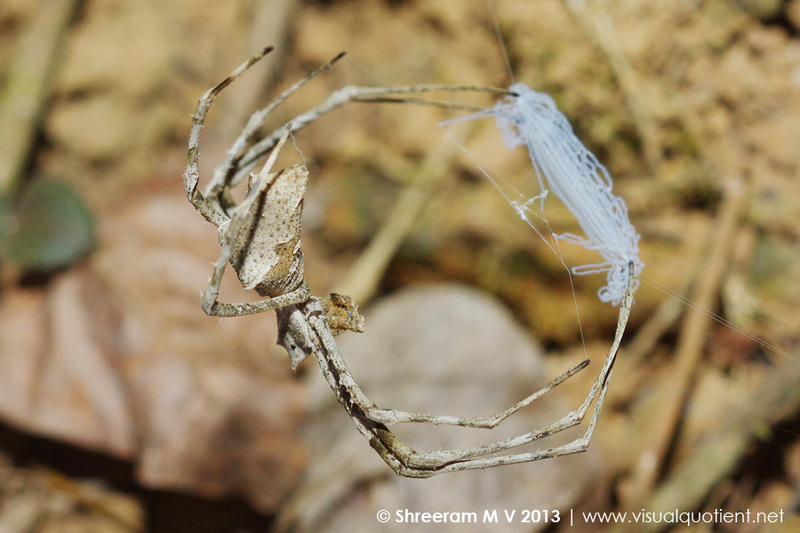 When a potential prey comes under the web, the web is stretched (upto 5 times its original size) and is cast on to the prey. Of course, the web is also sticky and small insects flying into it get entangled. There is only one known species of this family in India – Deinopis goalparaensis. They are mainly nocturnal and have excellent eyesight to practice their unique hunting strategy. The cryptic colouration, along with stretching out their legs, helps them imitate a twig when they rest. Coming back to the eyes – well, I haven’t seen them yet. I am hoping to see this spider again sometime. And stare into the eyes of the Ogre-eyed Spider (as it is also called). wow!! that was an interesting capture! Thank you for introducing us to this unusual 8-footer!